Maybe Vick Should Become a Cop. 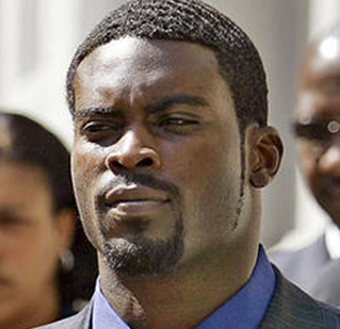 This past December, former Atlanta Falcons quarterback Michael Vick was sentenced to 23 months in Federal prison for dogfighting. 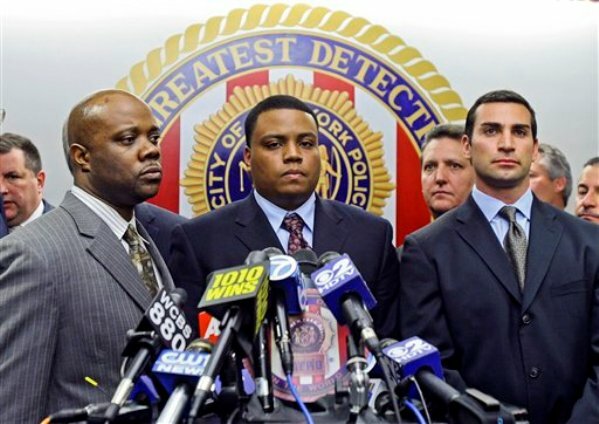 Of what significance is the fact that, for that cruel sport, he will serve far more time than New York Police Department detectives Michael Oliver, Gescard Isnora, and Marc Cooper, above, will do for killing Queens resident Sean Bell, in a hail of 50 bullets, the morning of his wedding day? I wish I’d made a note of which blog I saw offer Black men this advice: If you ever find yourself under heavy police fire, hold up a puppy. Besides, charter MEDIA ASSASSIN readers may recall a February post, mentioning that the Global Fund to Fight AIDS, Tuberculosis and Malaria spent $367 million in 2005 fighting those diseases in Uganda, the same amount Americans spent this year on Valentines for their pets. In the time it took to say those two words — Matt Ryan — Vick’s Falcons career, or what remained of it, came to a final resting place on the NFL sea bottom. The message is clear: The Vick Era, so to speak, is finished in Atlanta. A manhole cover has been all but welded shut over whatever hopes Vick has of returning to his first and only pro team, and to the doting owner who adored him, Arthur Blank. So, without job prospects in Atlanta pro football, should Vick, say, apply to the local police force when he gets out of Leavenworth in July 2009? Probably not: Most municipalities have provisions against their departments hiring criminals as cops. But, apparently, there’s no such rule in New York City. Would he move? I wonder how those killer cops vote? new york city, union members? I’ll go out on a limb and say killer Dems on the loose. 367 million wow thats like a year of Oprah cash or 1 NBA teams yearly payroll. cool game whats the point? Michael Vick will return to the NFL. There is no question in my mind. The NFL may not like the negative press that comes with Michael Vick, but Ray Lewis murdered someone – he just got away with it. Michael Vick will come back, PETA will hate it, and we’ll all get along with our lives. By the beginning of next season (not this upcoming one, but 2010), Michael Vick will be starting at QB somewhere in the NFL, and we’ll have moved on to the next controversy. That’s the nature of the beast – fueled by negative press until we find something worse. Someone else will mess up, and Michael Vick killing dogs will become a non-factor.